"Pyg doesn't hurt, Pyg heals, Pyg fixes…" One year after the events of Batman: Arkham City, Batman is back and better than ever! Based on the designs of the 4th installment of the Batman Arkham video game series, the Batman Arkham Knight Professor Pyg Action Figure features the deranged ringmaster of the "Circus of Strange". 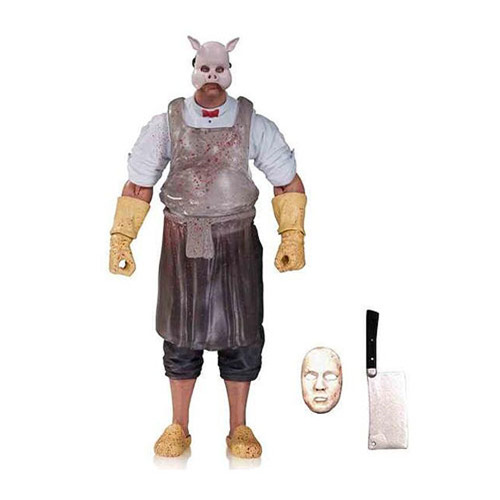 Splattered in blood and wearing his mask, the Batman Arkham Knight Professor Pyg Action Figure comes complete with character specific accessories such as alternate masks and a cleaver. Measures approximately 7-inches tall. Ages 14 and up.